Training with focus mitts, hand held pads and kicking shields is part of the training for many martial artists and self defense enthusiasts. This equipment allows you to practice your techniques at full speed and power without injuring your training partner. However, many practitioners use this equipment incorrectly, resulting in injuries for both the holder as the one striking it. Or they only achieve limited result by sticking to the same drills over and over. How to hold the pads correctly to avoid injuries. The most common mistakes when using the equipment. How to use the focus mitts and kicking shield for all sorts of striking techniques using arms and legs. How to use the equipment in all ranges: kicking, striking, clinching and on the ground. 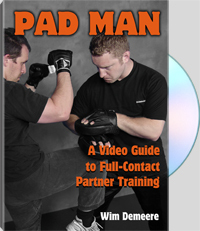 This video offers extensive information on using the equipment, regardless of the martial art or combat sport you practice.